August 4, 2014 – Osborne, Kansas – DNA™ Genetics recently completed the installation of 80 FIRE® (Feed Intake Recording Equipment) Pig Performance Testing Feeders to advance their swine genetic tests at a new, state-of-the-art facility in eastern Nebraska. The $4 million facility, appropriately called the InSight™ Performance Center, now has the capability to gather important performance data from more than 7,500 boars each year. 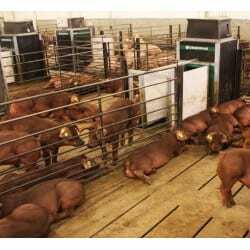 At the InSight Performance Center, DNA Genetics collects feed intake data using the Osborne FIRE Pig Performance Testing Feeder, on boars from three nucleus breeds: Duroc, Yorkshire and Landrace. The public can observe boars being tested with FIRE thanks to a bio-secure observatory conference room at the center. The area is open to groups and individuals who want to further understand the swine genetics industry and how animals are cared for and housed. FIRE, the gold standard in pig performance testing technology, is used by leading swine genetics companies all around the world. The system automates the measurement of individual daily feed intake and other important performance characteristics of growing animals for genetic, feed and pharmaceutical testing. DNA Genetics, owned and operated by Nebraska agri-business families, and based out of Columbus, Neb., is focused on producing the finest genetics for North American pork producers. For more information on DNA Genetics, visit www.DNASwineGenetics.com. Osborne Industries, Inc., is a diversified developer and manufacturer of advanced automated livestock systems, like the FIRE Pig Performance Testing System. Headquartered in North Central Kansas, Osborne Industries, Inc., is 100% employee owned, and FIRE is produced locally at their manufacturing facility in Osborne, Kan.
For more information on Osborne Industries, Inc., and the FIRE Pig Performance Testing System, visit osbornelivestockequipment.com.